Packed with a brilliant combo of sparking wit and superb writing, it’s no wonder this first installment of the Discworld bibliography spawned the 38-odd books that followed…and their devoted fans. 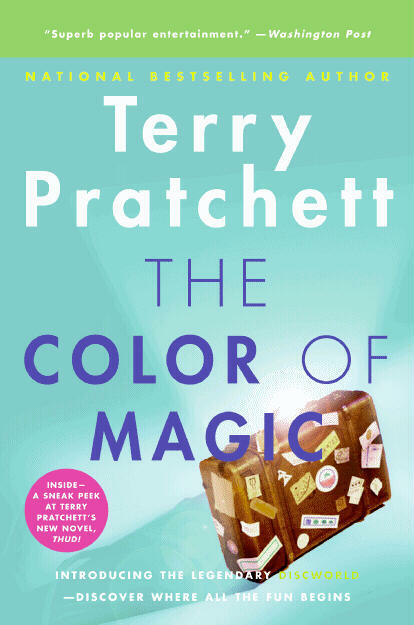 Hilarious, adventurous, inventive, but above all precise, even in its absurdity, Pratchett’s prose provides not only some welcome relief from the conventional fantasy world, but is first-rate reading all on its own. I highly recommend this to those seasoned fantasy-lovers looking to investigate the roots, influences, and permutations of today’s otherworldly fiction—or just those seeking something truly original, witty, and lighthearted. While I do think a younger reader would get a kick out of the superficial storyline, the satiric undercurrent of its humor, as well as some mature content, really make it a more satisfying read for the older bibliophile. In fact, the more you know of the allusions contained (Rincewind’s wizardly problems are a cracked mirror to those of LeGuin’s Ged, for instance), the more fun it becomes.